Great Alternative to a screened wristband! 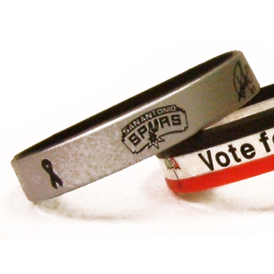 Text and graphics are still debossed, however, a color is added to the top to give it the color contrast of a traditional printed wristband. Pricing includes choice of one PMS matched silicone color (inside layer) with one PMS matched contrast color imprint (outside layer). 3/8" H x 2-3/4" W design area. For Multi color silicone bands add 0.10 (C) for each additional silicone color. CWR3G - Please add a run charge of $0.10(C) for Glow in the dark silicone with one PMS matched imprint color. Frosty white silicone changes to glow in the dark green, red or blue (choice of one).